In reality, time only moves in one direction. Beyond fading recollections locked within our mind's eye, moments gone cannot come again. In reality, the past has no form of its own, but in cinema... memories can be reborn. In cinema, there are no hands on the clock, no rigid constructs dictating linear progression. In cinema, past and present are free to dally side by side, mixed-up and intermingled into a cascading montage of bygone musings and ever-flowing seconds. 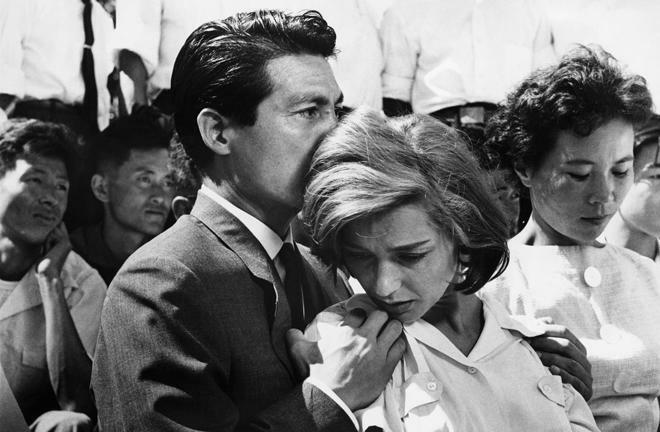 With its groundbreaking editing techniques and meditative style, Alain Resnais' 'Hiroshima mon amour' explores this unique temporal elasticity head on, using the tools of filmmaking to forever blur the line between what is and what once was. Set in post-war Hiroshima, the loose narrative focuses on a French actress (Emmanuelle Riva) who meets a Japanese architect (Eiji Okada) while shooting a movie in the city. Over a 24-hour period, the pair engages in a passionate affair. As the lovers struggle to accept their true feelings for one another, the woman begins to reminisce about a forbidden romance from her past. With the memories of her former transgressions now bleeding into the present, once forgotten pain is reignited, casting a murky shadow across the couple's own potential future. Two naked bodies embrace in a close-up, revealing only the lovers' arms and bare backs to the camera -- all covered in a glistening sheen of mournful ash. Equally sensual and forlorn, this hauntingly provocative opening image perfectly sets the tone for the dreamy reverie to follow, commencing an intimate tale of romance irrevocably tied to the devastating light of a thousand suns bursting in the sky. Indeed, the atomic bomb and all its destruction hangs heavy in the background throughout the runtime, instilling a palpable air of sorrow and unrest. To this point, the film's initial montage sequence plays out almost like a short documentary unto itself, making heavy use of archive footage and clips from Japanese movies about the bomb. With that said, the plight of Hiroshima is not the story's focus. Instead, Resnais goes on to use this powerful setting to examine bittersweet concepts of love, memory, time, and place, while probing deep into themes of loss, pain, identity, and healing. As day becomes night and night once again gives way to dawn, we follow the couple through the city as they discuss their affair and traumatic pasts. At face value, this series of events is really rather simple, amounting to little more than a few melodramatic conversations with little in the way of traditional narrative action -- but what truly makes 'Hiroshima mon amour' so unique and utterly absorbing has less to do with the actual details of its content, and much more to do with how that content is presented. Through a unique temporal structure in both script and visual form, the movie offers a highly influential storytelling aesthetic that has gone on to inform countless subsequent films. 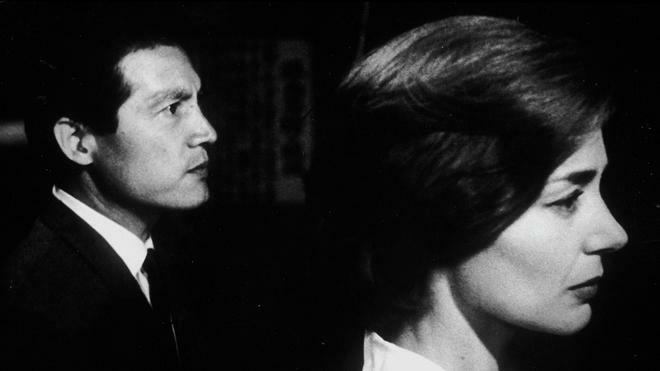 Using editing as a means to connect past and present, Resnais organically blends and juxtaposes the film's two parallel storylines: the woman's current affair in Hiroshima and her previous affair in France during the war. As she remembers her bygone experiences, bits and pieces of these events are gently cut into the narrative, but these flashbacks are not presented in a traditional manner. Instead, the approach is much more abstract and fragmented, mirroring the way in which memories actually flood our thoughts. Though some dissolves are employed sparingly, simple cuts are usually used to segue between the distinct time periods and locations, using similar angles, blocking, and camera movements to help ease the transitions. Likewise, audio from the present is usually maintained during these gently intruding snippets from the past, further helping to bridge the gap. While cutting from the present to the past like this might sound like a rather basic and common technique now, when it was first released, the movie's delicately seamless and malleable treatment of time was actually quite groundbreaking, opening up a slew of new possibilities for storytelling structure within narrative filmmaking. 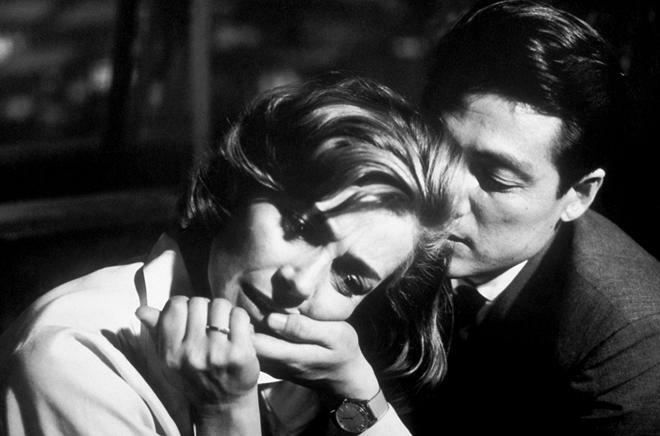 Flashbacks may have existed on screen before, but 'Hiroshima mon amour' is one of the first films to give true cinematic form to the concept of memory, fully deconstructing the rules of motion picture time. Intriguingly ambiguous in both story and form, the movie becomes a devastating meditation on time and place all wrapped up in a bittersweet silver screen romance. Mysterious and inherently unknowable, this is arthouse melodrama at its finest. Though Resnais' scarred characters may simply wish to bury the past, the director's influential style presents a lasting experience that the world of cinema will never be able to forget. Criterion presents 'Hiroshima mon amour' in their standard clear case with spine number 196. The BD-50 Region A disc comes packaged with a booklet featuring an essay by critic Kent Jones and excerpts from a 1959 Cahiers du cinema roundtable discussion about the film. The movie is provided with a black and white 1080p/AVC MPEG-4 transfer in the 1.37:1 aspect ratio. Sourced from the film's 2013 4K restoration, this is a strong video presentation with only a few minor qualms. The restored print is in great condition with only negligible signs of damage (early archive footage is a bit rougher, however). A light to moderate level of grain is retained throughout, preserving a natural filmic appearance. Though detail can be a bit soft in some indoor scenes, overall clarity is good, especially in close-ups, highlighting patterns in clothing and every speck of ash in the film's provocative opening shot. The grayscale is balanced well, but black levels do appear slightly elevated. With that said, the included restoration featurette reveals just how faded the contrast in the original print was, demonstrating the vast improvements made in this regard. Artifacts are mostly absent, but there is some faint contouring during fading transitions. Respectfully restored and free from any unnecessary digital processing, 'Hiroshima mon amour' arrives on Blu-ray with a great transfer, giving the film's influential style the HD treatment it deserves. The audio is presented in a French LPCM mono track with optional English subtitles. Marked by a moody score and effective design work, this is a very solid mix. Dialogue is clean and clear throughout with no balance issues or notable age-related hiccups. Dynamic range is a little on the flat side, but Giovanni Fusco's striking musical score comes through well, realizing each hauntingly enigmatic note with powerful precision. Subtle background effects like crickets and ambient clatter also help to enhance the film's dreamy atmosphere. Thankfully, there are no major signs of hissing, pops, or crackle. Considering its age, the mono track sounds quite good, giving the film's integral music cues due emphasis without any major issues. Criterion has put together a nice collection of supplements, including a commentary and several interviews with the director and star. All of the special features are presented in 1080p or upscaled 1080i. English subtitles are provided for the foreign language portions. Commentary by Peter Cowie – Film historian Peter Cowie provides a steady and informative track that covers a wealth of production trivia and critical analysis. Details on the film's path to the screen and influential editing style are all elaborated on, resulting in a very worthwhile commentary. Alain Resnais (HD) – Interviews with the movie's director from 1961 (6 min) and 1980 (11 min) are included. Resnais discusses the story's ambiguous nature and the production's evolution from a short documentary toward becoming a feature length narrative. Emmanuelle Riva (HD) – Interviews with the film's star from 1959 (6 min) and 2003 (19 min) are included. The actress talks about her casting, character, and what it was like to work with Resnais. Francois Thomas (26 min) – Here we get a 2015 interview with the film scholar. Thomas offers a comprehensive discussion about the movie's production, along with some analysis of its visuals and music. Memory and Meaning: The Music of Hiroshima mon amour (10 min) – This is a 2015 interview with USC professor Tim Page. Page elaborates on the film's unique use of music. Revoir Hiroshima (11 min) – This featurette focuses on the film's 2013 4K restoration. We get a few before and after shots along with an explanation about the process. 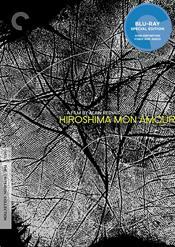 Alain Resnais' 'Hiroshima mon amour' is a powerful arthouse classic marked by an influential narrative structure and pioneering editing style. Through its absorbing examination of memory and place, the film becomes a haunting excursion into cinematic ambiguity. The video and audio are both strong, preserving the movie's striking visual aesthetic and score. Thankfully, the included supplements are all informative, offering worthwhile analysis and great insights from the director himself. While the film's experimental nature likely won't be for everyone, this is a great disc for a truly important piece of motion picture art. Highly recommended.